Pintaras Jaya just announced a contract being awarded today after such a long period of time without a new job order. 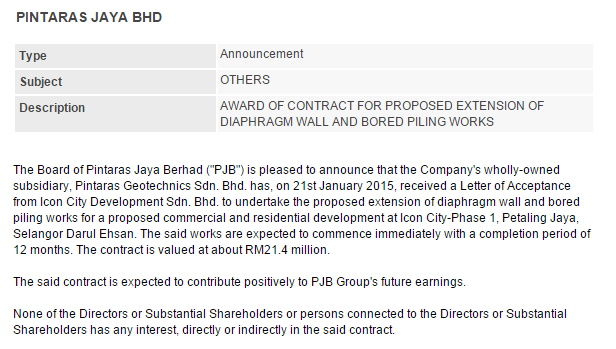 Job scope is to undertake diaphragm wall and bored pilling works for commercial and residential development project that worth around RM21.4 mils with a completion period of 12 months. With this contract, the group has around 4 job orders in progress after January. Hope to see more contracts being awarded soon which provide greater earning visibility. By the way, Econpile received Rm128.9 mils contract at the same time .. Hmmm different margin, different completion period. Chin Well: After Acquisitions ..